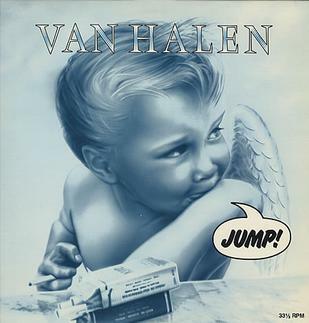 The sixth studio album from Van Halen brought the band bestselling success and a their first number one single: Jump. Written in 1981 by Eddie Van Halen, the other band members rejected the song for their previous album Diver Down. Producer Ted Templeman asked David Lee Roth to listen to the song and hopefully get inspired for their upcoming album. Roth listened to the song with band roadie Larry Hostler, trying to come up with the right lyrics. Inspired after remembering a television report about someone trying to commit suicide, Roth came up with the chorus for the song. Instead of focusing on suicide, Roth focused on someone taking the leap for love in the song lyrics. The album and song were recorded at the 5150 Studios in Studio City, California and showcased Eddie Van Halen’s newfound interest in the synthesizer. Released in December 1983 ahead of the release of the album MCMLXXXVI (1984), the song climbed the charts and hit the number one spot in February 1984. The accompanying music video, showcasing the stage performance of the band, propelled the song to be on regular rotation on MTV and MuchMusic in Canada. It won three awards from the MTV Video Awards. Used by several sports teams including AC Milan football club and the Winnipeg Jets hockey team, the song has become embedded in pop culture since its release in the early 1980s. The song was chosen by The Rock and Roll Hall of Fame as one of the 500 songs that shaped rock ‘n’ roll. This entry was posted in Pop culture and tagged 1980s, 1983, 1984, Billboard Hot 100, hard rock, Jump, MCMLXXXVI, Music, Pop culture, rock n roll, single, song, Van Halen. Bookmark the permalink.